As with many things in life…he wasn’t wrong about The Cross of The Martyrs. Probably don’t tell him I said that, though, or I’ll never hear the end of it. We decided to spend a few days chilling out in the New Mexico sun after our wedding. Since Les is a keen photographer, the opportunity to, well…take photos of things, means I spend a LOT of time in strange places at odd times of the day and night. Les had read an article about the Santa Fe National Historic Trail, which was a short drive from our apartment. The part of the trail near us was Fort Marcy Park. It was suggested to me that I might like to go to the park under the guise of ‘getting some exercise…’ I felt this was appropriate, given my tamale and tequila consumption since we’d arrived in New Mexico. We headed up Paseo de la Loma, which sits in an elevated position overlooking the city. The views it offers across Santa Fe and beyond is unrivalled. The Cross of the Martyrs sits within Fort Marcy Park, so the site is really two attractions in one. Fort Marcy Park was a built as military stronghold after the American invasion of Mexico. It was constructed in a strategic position, overlooking the city of Santa Fe, and allowed the Americans to defend their control over the New Mexico territories. The government of Santa Fe purchased the park in the 1960s. It has since been preserved for its historical significance. Given its height was used as means to defend Santa Fe, its elevated position offers a stunning overlook. The park has ample car parking spaces on the brow of the hill, and for a sunset, it’s a relatively quiet time to visit. There are interpretation boards positioned around the site. These help to provide a detailed history of the site and its historical importance. The white concrete cross, which stands at 25ft, stands in a circular area just outside Fort Marcy Park. The cross stands as a reminder of 21 Franciscan Monks, who were killed during the Revolt of Pueblo of 1680. The area is a well-known spot, mainly because of its elevated position. It’s *the* place for catching the sun setting over the mountains. There are several levels for viewing, both above and below the Cross of the Martyrs. 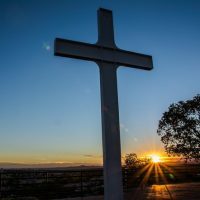 Have you watched the sunset at the Cross of the Martyrs?